Welcome to the latest edition of Flexible Boss. 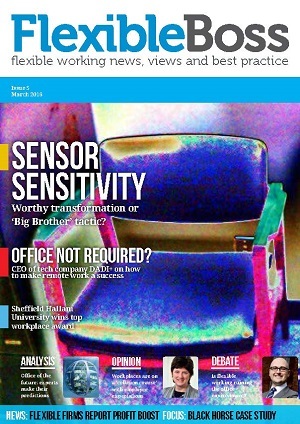 This quarter, we take a look at the use of sensors in the workplace. Many companies are now using them to monitor the effectiveness of their work spaces and enable the shift to agile working. However, a recent issue at the Telegraph, where staff rejected their use, highlights the need to tackle Big Brother perceptions and put people at the heart of progress. Continuing the future theme, we take a look predictions for work and life in 2030 and beyond, from underwater cities to hologram meetings. We also speak to the chief executive of a business that rejected bricks and mortar and runs on an entirely remote basis – employing a head of happiness to ensure employee satisfaction and engagement. Also in this issue, there is a great line-up of expert opinions on all aspects of flexible working, including case studies from Black Horse Finance, Sheffield Hallam University and news from the Cabinet Office. Is flexible work destroying the office? Gen Y: are they really so different? ‹ Is flexible work destroying the office?